Since David introduced me two weeks ago as the new kid on staff, I have received several questions from friends about how Chinese medical specialists diagnose patients (i.e. how can you diagnose me)? The following is a short-summary. Diagnostic Techniques: Indo-Tibetan, Sino-Russian, Sino-Japanese medicines all use a refined system of diagnostic tools to gain information about the internal conditions of a patient. 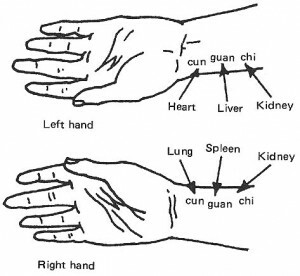 In Chinese medicine, we can divide the diagnostic techniques into four basic groups. Pulse – The radial artery consists of three points on each wrist that are used to diagnose organ conditions and energy patterns within the body. Reading the pulse is an art form that is primarily learned through direct experience, under the guidance of a teacher who can help point out the physiological correlation of the different pulse patterns, however, there are many books which are also published on this subject. A highly skilled practitioner also understands how the pulse tells the psychological condition of the patient as well. Tongue – The tongue is like the dashboard of the body. The tongue is subdivided into regions that correspond to all of the organs. Colors, textures, size, and shape of the tongue and its sub-regions is used to assess internal conditions with a high degree of accuracy. Sight/Smell – The skilled TCM practitioner will also use observed information such as smells emitted from the patient’s body, condition of hair and finger nails, bodily markings, facial characteristics, and even cheirology (hand analysis). There is a wealth of information available just from looking at a person’s face! Listening – Last, but not least, the TCM practitioner relies on the patient to provide information about his or her primary treatment goals, sleep habits, bowl movements, and physical symptoms. Pulse, tongue, sight and smell are used as corroborating evidence to determine the unique cause of the symptoms and to prescribe the appropriate medication. For example, a patient may come in complaining of diarrhea and anxiety but it is the pulse and tongue which will reveal in most cases whether the cause is from a hot or cold type pathogen. This type of differentiation is based on the relationship of yin & yang, and will be discussed in my next BLOG article on the 8 Trigrams. There are also books available today on herb and drug interactions which have been produced through extensive research techniques by pharmacists to provide up to date information on the interaction between natural and artificial drugs. 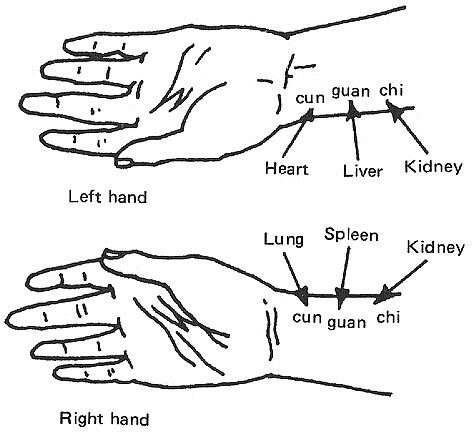 The skilled TCM practitioner has to be mindful of this information as well. David has extensive training in herb-drug interactions and anyone who is already on a pharmaceutical regimen that involves medications such as blood-thinners should consult with Dr. D.
While a diagnostician can provide a wealth of information regarding a patient’s internal status, it is still the responsibility of the patient to prioritize their treatment goals. Good TCM docs are not magic genies. They can provide answers to complex questions and help guide a patient towards better health, but they cannot read minds or grant wishes. It is very important that patients keep track of their own health progress and communicate clearly with the doctor during your visits. Stephanie’s experience: I have been studying tongue and pulse in both clinical and non-clinical settings since 2003. I have spent many hours of observation and study to learn to distinguish patterns in the body and determine the appropriate treatment . Friends, teachers, relatives and other students have been very obliging in sticking out their tongue for me and being willing to discuss intimate details of their personal lives as part of my learning opportunity. I place a high value on syndrome differentiation and five element diagnosis, and for this reason I am attracted to Oriental medicine instead of Western herbal medicine.